Silver will return to ’something close to its historical ratio to gold’ and pass $500 an ounce when gold makes its epic run from $1,300 to $10,000-plus predicts ‘The Money Bubble’, a new book from GoldMoney.com founder and former head of commodities for the Abu Dhabi Investment Authority, James Turk and John Rubino. The authors explain in great depth how gold prices will grow and grow in a spectacular blow-off as global money printing finally gets out of control. Think of it as the 1970-80 gold price explosion on steroids. The silver price is leveraged against gold, and outperforms on the way up and vice-versa. Silver is a substitute for gold when prices go too high. The authors cite the record 6,000 tonnes of silver imported by India last year, an amount equivalent to 20 per cent of global mine production, as a classic case of substitution for gold when a 10 per cent tax made the yellow metal expensive. True silver prices are manipulated by central banks like gold as this book clearly demonstrates. But the price rise from $6 per ounce in 2006 to $49 in 2011 shows that manipulation is not a perfect art. So if a single group is making money then there is another group that is losing money. In the trading fraternity, the profitable group is usually smaller than the loss making group. So what makes find this group different? It is the way that his group understands risk and how they apply various techniques to manage their money. 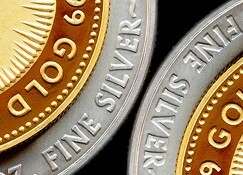 The real issue for silver is the ratio of available silver to gold of 3:1 when the price ratio is currently 65:1. If there is ever a rush to buy silver there is just not going to be enough in stock and that will send the price higher and bring its price ratio to gold tumbling back towards its much lower historic levels. In 2013 Sprott Asset Management reported its clients were buying equal amounts of gold and silver, or more than 50 times as much silver as gold by weight. Where’s that future supply going to come from? All it takes is for gold to gets its mojo back and silver is really off to the races. How long will that take? The authors are long on good advice and short on timing predictions. They conclude that ‘by the latest in 2015′ gold will begin its epic price ascent, although they admit to being wrong-footed by the co-ordinated central bank attack on the gold price in 2013. It is always possible that the empire of the central banks will strike back again but their fire power is losing its clout these days. Gold needs to be around $10,000 an ounce to resume its role as a linchpin to global financial stability claims this useful book, and the logical side-effect will be $500 silver.